In a previous paper (Picco et al., 2015), the dynamic architecture of the protein machinery during clathrin-mediated endocytosis was visualized using a new live imaging and particle tracking method. Here, by combining this approach with correlative light and electron microscopy, we address the role of clathrin in this process. During endocytosis, clathrin forms a cage-like coat around the membrane and associated protein components. There is growing evidence that clathrin does not determine the membrane morphology of the invagination but rather modulates the progression of endocytosis. We investigate how the deletion of clathrin heavy chain impairs the dynamics and the morphology of the endocytic membrane in budding yeast. Our results show that clathrin is not required for elongating or shaping the endocytic membrane invagination. Instead, we find that clathrin contributes to the regularity of vesicle scission and thereby to controlling vesicle size. Clathrin-mediated endocytosis is a conserved cellular process for uptake of nutrients and internalization of cell surface components. The cage-forming protein clathrin is a major coat component thought to scaffold membrane and protein machinery during vesicle formation. In yeast, clathrin contributes to actin-dependent endocytosis and is present at all endocytic sites but is not essential for endocytic uptake (Newpher et al., 2005; Chu et al., 1996; Payne et al., 1988). Previous research has shown that upon deletion of clathrin heavy chain, there is a 73% reduction in the frequency of endocytic vesicle budding events (Kaksonen et al., 2005; Newpher and Lemmon, 2006a), which can explain the reduced rate of receptor-mediated uptake (Chu et al., 1996; Payne et al., 1988). The clathrin heavy chain deletion phenotype can be partially rescued by overexpression of clathrin light chain (Newpher et al., 2006b). These findings suggest a role for clathrin in efficiently initiating vesicle budding. Although deletion of clathrin heavy chain also causes a strong growth phenotype and accumulation of internal membrane compartments (Payne et al., 1988; Payne and Schekman, 1985), the reduction of receptor-mediated endocytosis is independent of these effects (Tan et al., 1993). The abnormal morphology and slow growth of clathrin-deficient cells is likely a downstream, cumulative effect of disrupted clathrin-mediated vesicle formation at the trans-Golgi network, endosomes and plasma membrane (Newpher et al., 2005; Brodsky et al., 2001). Taken together, previous studies suggest that clathrin plays a role in initiating vesicle budding. However, roles for clathrin at stages following initiation are not clear. Clathrin is able to induce membrane curvature in vitro (Dannhauser and Ungewickell, 2012), but the distribution of endocytic invagination depths as well as the localization of endocytic coat components observed by immuno-electron microscopy do not change significantly upon clathrin deletion, suggesting that clathrin does not define membrane morphology in vivo (Idrissi et al., 2012). We have previously proposed that clathrin assembles on a flat membrane and only forms a curved lattice upon actin-induced membrane bending in yeast (Kukulski et al., 2012a). In mammalian cells, it was recently shown that the curvature of the clathrin coat changes during vesicle budding (Avinoam et al., 2015). Thus, there is growing evidence that the clathrin coat is not a rigid scaffold that imposes shape to the forming endocytic vesicle. We have previously used live cell imaging and correlative light and electron microscopy to generate a detailed quantitative description of assembly dynamics of the endocytic protein machinery and the corresponding membrane morphology changes in budding yeast (Picco et al., 2015; Kukulski et al., 2012a). Here, we have applied these methods to budding yeast cells in which the gene encoding clathrin heavy chain has been deleted (chc1Δ) to clarify the role of clathrin during membrane reshaping and vesicle formation. We first asked how the dynamics of membrane invagination are affected by the absence of clathrin. The Sla1 protein assembles into the endocytic coat before the membrane starts bending and then moves in at the tip of the membrane invagination (Picco et al., 2015; Idrissi et al., 2008). Although fewer endocytic sites are observed in chc1∆ cells, Sla1 marks those that successfully initiate budding (Kaksonen et al., 2005; Newpher and Lemmon, 2006a). The distribution of Sla1 on the invagination is not altered by the deletion of clathrin (Idrissi et al., 2012). The movement of the Sla1-GFP centroid, therefore, acts as a marker for the growth of the endocytic membrane invagination (Picco et al., 2015). We tracked the fluorescence intensity and movement of Sla1-GFP in living wild-type and chc1∆ cells (Figure 1A and Figure 1—figure supplement 1). The total lifetime of Sla1-GFP at the endocytic sites was shortened in chc1∆ cells, due to an accelerated assembly phase, as described previously (Kaksonen et al., 2005; Newpher and Lemmon, 2006a), and Sla1-GFP disassembly at the end of the endocytic process was subtly slowed down (Figure 1—figure supplement 1). The Sla1-GFP centroids moved slightly further into the cell than in wild-type cells (Figure 1B), probably as a consequence of the slowed disassembly of Sla1-GFP that allowed us to track the patches in the cytoplasm for longer. The rate of the Sla1-GFP centroid movement in chc1Δ cells was indistinguishable from that of Sla1-GFP in wild-type cells (Figure 1A and B). Thus, the speed at which the invagination elongates was not affected by the lack of clathrin. Sla1 and Rvs167 dynamics in chc1Δ cells. (A) Representative examples of Sla1-GFP trajectories from wild-type (upper row) and chc1Δ cells (lower row). Green triangles and red squares mark start and end points of the trajectories, respectively. Scale bar is 100 nm. (B) Average Sla1-GFP inward movement over time, in wild-type cells (black line, n = 50 trajectories) and chc1Δ (red line, n = 41 trajectories). Shadings indicate the 95% confidence interval. (C) Representative examples of Rvs167-GFP trajectories from wild-type (Picco et al., 2015) (upper row) and chc1Δ cells (lower row). Green triangles and red squares mark start and end points of the trajectories, respectively. Scale bar is 100 nm. (D) Average Rvs167-GFP fluorescence intensity over time, in chc1Δ (red line, n = 56 trajectories) and wild-type cells (black line, n = 54 trajectories). Fluorescence intensity profiles have been normalized between 0, which corresponds to their minimum in intensity, and 1, which corresponds to their maximum in intensity. Shadings indicate the standard deviations from the mean. We then asked if scission of the vesicle is affected by the absence of clathrin. Rvs167 is an amphiphysin-like BAR domain protein that assembles at the tubular part of the invagination and regulates vesicle scission (Picco et al., 2015; Kukulski et al., 2012a; Youn et al., 2010; Smaczynska-de Rooij et al., 2012; Kishimoto et al., 2011). 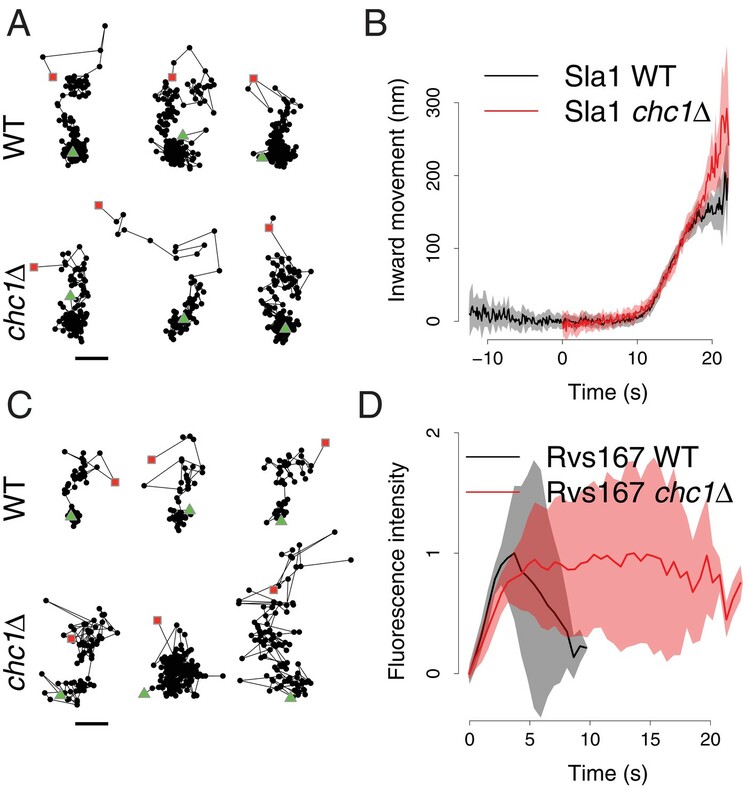 In wild-type cells, the peak in Rvs167-GFP fluorescence intensity coincides with scission (Kukulski et al., 2012a) and the rapid directional disassembly of Rvs167 after scission leads to a fast inward movement of the Rvs167-GFP centroid (Picco et al., 2015). Rvs167-GFP movement and peak fluorescence intensity therefore act as markers for vesicle scission in wild-type cells. The Rvs167-GFP centroid trajectories in chc1Δ cells often did not display the characteristic fast inward movement observed in wild-type cells, but appeared highly irregular (Figure 1C). Due to this irregularity, we could not align and average the Rvs167-GFP centroid movements as we did for Sla1-GFP. When we examined the fluorescence intensity of Rvs167-GFP at the endocytic sites, we found that the time taken to assemble Rvs167-GFP molecules at the endocytic site was similar in both chc1Δ and wild-type cells (Figure 1D). However, after the assembly phase, the fluorescence intensity of Rvs167-GFP persisted significantly longer in chc1Δ cells than in wild-type cells (Figure 1D). These findings suggest that the disassembly of Rvs167 molecules and thereby the regulation of vesicle scission are impaired in chc1Δ cells. To directly visualize the effects of clathrin absence on membrane reshaping, we applied correlative fluorescence microscopy and electron tomography. We thereby located and imaged endocytic intermediates in chc1Δ cells expressing Sla1-GFP as well as Abp1-mCherry, which we used as a marker for the presence of invaginations or vesicles (Kukulski et al., 2012a). We reconstructed electron tomograms of 59 endocytic sites marked by Abp1-mCherry, or by both Abp1-mCherry and Sla1-GFP (Figure 2A, see also 'Materials and methods'). From these data, we extracted membrane profiles of invaginations and analyzed their shapes. We measured invagination depth, curvature of invagination tips (Figure 2B), appearance of tubular segments and position of the neck (Figure 2—figure supplement 1). All parameters showed a similar distribution as in wild-type cells (Kukulski et al., 2012a). We next measured the axes of ellipsoids fitted to endocytic vesicles. We calculated vesicle surface areas and found that on average they were similar to wild-type, but the variance was significantly larger (chc1Δ: mean 7’291 nm2, SD 4’373 nm2, n = 51. wt: mean 6’380 nm2, SD 1’929 nm2, n = 62. p<0.0001 for variances) (Figure 2C, see also 'Materials and methods'). Thus, while invaginations were unaffected, vesicle sizes were significantly more variable in absence of clathrin. Endocytic membrane morphologies in chc1Δ cells. (A) Correlative fluorescence and electron microscopy of chc1Δ yeast cells expressing Sla1-GFP, Abp1-mCherry. Three examples of membrane ultrastructures underlying sites of Sla1 and Abp1 colocalization. Upper panel shows overlays of RFP and GFP channel images, lower panel images are virtual slices through electron tomograms, acquired at positions corresponding to the fluorescent spots marked by the white dashed circles. Black arrowheads indicate endocytic vesicles. Scale bars are 2 µm in the upper panel, 100 nm in the lower panel. (B) Curvature of invagination tips identified by correlative microscopy in chc1Δ, plotted against the invagination depths. The dashed line is a cubic smoothing spline fitted to the data points of wild-type invagination tip curvatures, published in (Kukulski et al., 2012a). (C) Surface areas of vesicles identified by correlative microscopy in chc1Δ and compared to wild-type cells (Kukulski et al., 2012a). Red central line represents the mean, upper and lower red lines represent standard deviations. Taken together, our data shows that the rate at which the invagination (marked by Sla1-GFP) grows, as well as the detailed morphology of the membrane invaginations observed by electron tomography, were the same in wild-type and chc1Δ cells. We thus conclude that the invagination process is unaltered, and neither elongation nor shaping of the invagination requires clathrin. Clathrin has been shown to induce membrane curvature in vitro (Dannhauser and Ungewickell, 2012), and we cannot rule out that it has a membrane sculpting role in other vesicle budding events, for instance when the membrane is subjected to less pressure than the turgor of the yeast cell. Furthermore, we observed that disassembly of Rvs167-GFP, which is a marker for scission in wild-type cells, became highly irregular in chc1Δ cells and the resulting vesicles were significantly more variable in size. Since invagination morphologies were unchanged, it is likely that the here described variability of vesicle sizes is related to a loss of regulation of the position of the scission site or of the correct timing of the scission event. How clathrin modulates disassembly of Rvs167 is an open question: The two proteins occupy adjacent regions on the endocytic invagination (Idrissi et al., 2008), and in vertebrates, amphiphysins bind directly to clathrin and the endocytic adaptor AP-2 (McMahon et al., 1997; Ramjaun and McPherson, 1998; Slepnev et al., 2000). Thus, we speculate that protein-protein interactions involving clathrin could modulate the disassembly dynamics of Rvs167, either through direct binding or recruitment of other regulatory proteins. Previous work showed that clathrin has a role in initiating the vesicle budding process. Our study shows it has an additional role in modulating endocytic protein disassembly and the timing or position of the scission event and thereby the sizes of the resulting endocytic vesicles. We found no role for clathrin in sculpting the membrane during endocytic invagination in budding yeast. Yeast strains were generated using the toolbox described by Janke et al., 2004. Strains were maintained as heterozygous diploids to minimize generation of suppressors of the clathrin deletion mutation, as described in (Kaksonen et al., 2005). Correlative fluorescence microscopy (FM) and electron tomography (ET) procedures were essentially as previously published (Kukulski et al., 2011, 2012b). After sporulation of strain MKY2800, cultures of haploid chc1Δ, Sla1-GFP, Abp1-mCherry were grown for a maximum of 2 days before high-pressure freezing. Cultures grown at 25°C in SC-Trp medium to exponential phase were pelleted by vacuum filtration and high-pressure frozen using a Bal-tec HPM010 (McDonald, 2007). Freeze substitution, embedding in Lowicryl HM20 and sectioning was performed as before (Kukulski et al., 2012a). We used 50 nm TetraSpeck beads (Life Technologies), diluted 1:50 in PBS, as fiducial markers for correlation between FM and ET (Suresh et al., 2015). FM of grids was done on the same day, as described before (Kukulski et al., 2012b; Suresh et al., 2015). Grids incubated with 15 nm Protein A covered gold beads and stained with Reynold’s lead citrate were subjected to ET exactly as described before (Kukulski et al., 2012a), using SerialEM for automatic tilt series acquisition and IMOD for reconstruction (Mastronarde, 2005; Kremer et al., 1996). The correlation procedure was performed using the in-house written procedure based on the Matlab Control Point Selection Tool (Kukulski et al., 2011). Positions of GFP and mCherry spots of interest were predicted by correlating TetraSpecks visible in average images of selected virtual slices of low-magnification tomograms to TetraSpeck signals in the respective channels. For further transformation into high-magnification tomograms, the 15 nm gold beads were used. We performed correlative microscopy on chc1Δ cells expressing Sla1-GFP and Abp1-mCherry. Like in wild-type cells, Sla1 in chc1Δ assembles at endocytic sites earlier than Abp1. The two proteins colocalize for several seconds, before Sla1 disassembles, followed by Abp1 a few seconds later (Kaksonen et al., 2005). We reconstructed 31 endocytic sites at which Sla1 and Abp1 colocalized. All these sites corresponded to ribosome exclusion zones that represent the endocytic machinery including the actin network (Kukulski et al., 2012a). Twelve contained invaginations, 15 contained vesicles, 3 contained invaginations and vesicles and 1 was a ribosome exclusion zone on a flat plasma membrane, containing no invagination or vesicle. Of the 28 sites at which Abp1 was present and Sla1 absent, 21 contained vesicles in ribosome exclusion zones and 7 were ribosome exclusion zones on a flat plasma membrane. In our correlative microscopy data set on chc1Δ, we also found an enrichment of sites consisting of more than one endocytic structure, as compared to the wild-type, such as two vesicles or two invaginations within one ribosome exclusion zone. In wild-type cells, about 5% of fluorescent spots consisted of multiple endocytic structures (Kukulski et al., 2012a). In chc1Δ cells, 13 of 59 Abp1-mCherry or Abp1-mCherrry/Sla1-GFP spots contained more than one endocytic membrane structure (22%). One of these sites contained 2 invaginations of different depths, 3 contained one invagination and one vesicle each, 6 contained 2 vesicles each and 3 contained 3 vesicles each. All these membrane ultrastructures were included in the quantitative analysis of membrane shapes, thus the presented data contains membrane structures from both single and multiple sites. For most of the parameters, there was no difference between single and multiple sites. However, the average surface area of vesicles from multiple endocytic sites is smaller than of vesicles from single endocytic sites in chc1Δ (chc1Δ ‘multiple site vesicles’: mean 5’720 nm2, SD 2’688 nm2, n = 24. chc1Δ ‘singles’: mean 8’688 nm2, SD 5’106 nm2, n = 27. p = 0.0118). They are similar to vesicles in wild-type cells (chc1Δ ‘multiple site vesicles’: mean 5’720 nm2, SD 2’688 nm2, n = 24. wt: mean 6’380 nm2, SD 1’929 nm2, n = 62. p = 0.2803 for mean). Furthermore, when only comparing chc1Δ vesicles from single endocytic sites to wild-type vesicles, there is a difference in their average surface areas (chc1Δ ‘singles’: mean 8’688 nm2, SD 5’106 nm2, n = 27. wt: mean 6’380 nm2, SD 1’929 nm2, n = 62. p = 0.0301 for mean). Two-tailed, unpaired t-tests with Welch’s correction (assuming non-equal SD) were used to calculate the p values. To measure membrane parameters of invaginations and vesicles, we applied the same procedures as for the wild-type data set (Kukulski et al., 2012a). Thus, the parameters extracted from the chc1Δ dataset could be directly compared to the wild-type data. In brief, we used the EM package in Amira (Pruggnaller et al., 2008) to click points on the cytosolic leaflet of all invaginating membranes in a virtual tomographic slice showing the long axis of the invagination. The sets of points were aligned to an x-axis that represents the plasma membrane, and interpolated with a local second-degree polynomial fit in MATLAB. We used this data to determine the invagination depth, appearance of tubular segments, radius of the invagination tip and the position of the invagination neck (Kukulski et al., 2012a). The Amira EM package was also used to click points on the cytosolic leaflet of vesicle membranes within the tomographic volume. The points were used to fit an ellipsoid (MATLAB) and extract the three major axes from the vesicle. These were used to calculate the vesicle membrane surface area (Kukulski et al., 2012a). We used GraphPad Prism for statistical analysis and comparisons of data sets. Sporulated haploid strains were grown to log phase in SC-Trp medium and were adhered on a 25 mm coverslip that was first incubated for 10 min at room temperature with 40 µl of Concanavalin A (100 µg/ml) and then washed with SC-Trp medium. Cells were then imaged on the coverslip in 40 µl of SC-Trp at room temperature. The imaging was done with an Olympus IX81 inverted microscope equipped with an Olympus 100 x/1.45 NA TIRF objective, a GFP-3035C-OMF single-band filter set (Semrock) and a Hamamatsu ImagEM EMCCD set at full gain. Cells were excited for 80 ms (Rvs167-GFP) or 100 ms (Sla1-GFP) with a 488 nm laser. Images were processed with ImageJ. They were corrected for photobleaching and the local background was corrected by subtracting from the image the same image processed by a median filter with a kernel of 6 pixels (Picco et al., 2015). The spots were tracked using the Particle Tracker plugin in ImageJ (Sbalzarini and Koumoutsakos, 2005). In wild-type and chc1Δ cells, spots were tracked with the aim of not losing the dim phases at the beginning or at the end of the proteins lifetimes. The few fluorescent patches that showed abnormal brightness heights were discarded to reduce the chance of tracking sites with multiple endocytic events. Annual Review of Cell and Developmental Biology 17:517–568. Journal of Biological Chemistry 271:33123–33130. Proceedings of the National Academy of Sciences of the United States of America 109:E2587–E2594. Journal of Cell Biology 180:1219–1232. Proceedings of the National Academy of Sciences of the United States of America 108:E979–E988. Journal of Cell Biology 192:111–119. Methods in Cell Biology 79:23–56. Molecular Biology of the Cell 17:4343–4352. Journal of Cell Biology 106:1453–1461. Journal of Structural Biology 164:161–165. Journal of Structural Biology 151:182–195. Journal of Biological Chemistry 275:17583–17589. Molecular Biology of the Cell 26:1601–1615. Journal of Cell Biology 123:1707–1716. Molecular Biology of the Cell 21:3054–3069. Thank you for submitting your article "Revisiting the role of clathrin in yeast endocytosis: Clathrin modulates vesicle scission, but not invagination shape" for consideration by eLife. Your article has been reviewed by three peer reviewers, and the evaluation has been overseen by Reviewing Editor Suzanne Pfeffer and Vivek Malhotra as the Senior Editor. This submission reports a correlative light and electron microscopy analysis of the dynamics of endocytic vesicle formation in chc1∆ yeast cells. The authors report that chc1∆ does not affect elongation or morphology of endocytic invaginations. However they describe significant persistence of Rvs167 at endocytic invaginations and a greater variability in the size of endocytic vesicles in chc1∆ cells. Based on these findings the authors propose that clathrin is not required for membrane invagination but instead regulates vesicle scission and size. Although there are some issues with interpretation of the data, the findings generally support the conclusions and will be of general interest. The work is appropriate as a Research Advance because it extends a previous study published in eLife (Picco et al., v4:e4535) by adding correlative light and EM analysis to investigate the question of clathrin function, which was not considered in the published work. 1) The authors conclude in the Results and Discussion section (first paragraph) that Sla1-GFP centroid movement in chc1∆ cells is indistinguishable from that in wild-type. However, in Figure 1B, although the rate of Sla1 inward movement is the same, there is a clear extension of movement in chc1∆ cells. This difference should be noted and addressed in the text. The observation is consistent with data in Idrissi et al. (Figure 2F, PNAS 109:2587-94. 2012) that shows an increase in Sla1 immuno-gold labeling of the longest invaginations in chc1∆ compared to wild-type cells. Considering the apparent defect in scission in chc1∆ cells, longer Sla1 invaginations are not particularly unexpected and do not present a challenge the authors' model. 2) The authors conclude from the data in Figure 2—figure supplement 1 that the detailed morphologies of membrane invaginations are the same in mutant and wild-type cells (Results and Discussion, fourth paragraph). In panel A, the equivalence of membrane angle versus invagination depth in mutant and wild-type cells is not entirely convincing. With the available data points, there could be a trend towards tubulation at shorter invagination stages in the mutant cells. Statistical analysis of the data or analysis of more mutant profiles could address this concern. An alteration in one aspect of invagination morphology does not detract from the striking anomaly in Rvs167 (scission) behavior in the absence of clathrin. 3) It is plausible that clathrin may still contribute to membrane sculpting in cells that are not subject to the same turgor pressure as yeast (and do not rely as heavily on actin for invagination). The authors should acknowledge this possibility. 4) There are many possible factors that can cause a change in vesicle scission and size and the authors do not show a direct link between clathrin and the role of Rvs167 in vesicle scission. Please state this explicitly. Additionally, the authors study endocytosis in a clathrin knockout cell line, but do not discuss how sick chc1∆ cells and how this may affect their results. 5) In the second paragraph of the Introduction, it is stated that there is diminished vesicle budding and receptor internalization in the chc1∆ background. Please provide a quantitative indication of the magnitude or extent of this decrease. 6) Please state explicitly whether the number of Sla1-GFP and Rvs167-GFP puncta that form over a given time interval in the chc1∆ yeast is equal to WT yeast. If not, the relative appearance frequency should be provided. 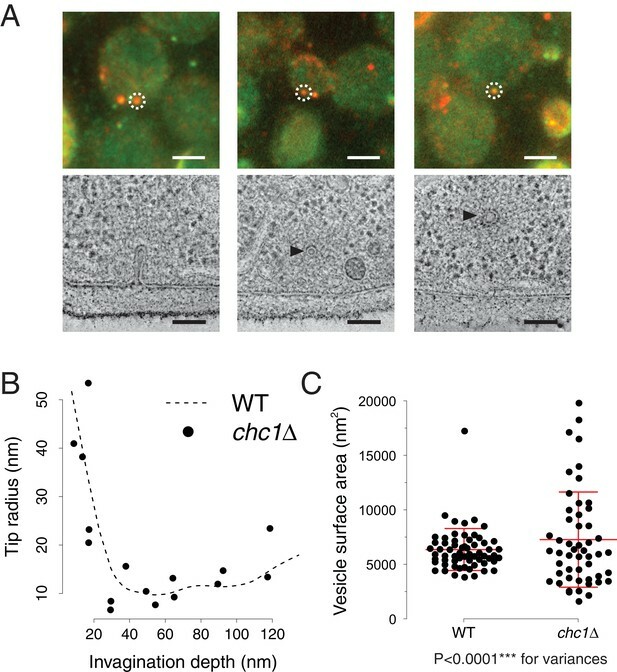 7) In Figure 2—figure supplement 1, the number of filled circles (chc1∆) versus open circles (WT) suggests that the endocytic structures in chc1∆ strains are more infrequent than in WT. Why? 8) The data presented and the conclusions drawn do not provide a coherent or explicit explanation for the slowed endocytosis in chc1∆ strains. The text does not discuss whether this is due to decreased nucleation or slowed maturation. The reader is left to puzzle this out for her/himself. In Figure 1D, is the slowed loss of Rvs17-GFP in the chc1∆ stain sufficient to explain diminished endocytosis because of a limiting pool of Rvs167 since it is delayed at abnormal sites in chc1∆ cells? 9) The fourth paragraph of the Results and Discussion states that "… the rate at which the invagination (marked by Sla1-GFP) grows, as well as the detailed morphology of the membrane invaginations observed by electron tomography, were the same in wild type and chc1∆ cells." But this only pertains to the ones that they see and score. If the overall number of Sla1 puncta is decreased, does this perhaps argue for another earlier function for clathrin? 10) If the main point is that Rvs167 delays at endocytic patches cause somewhat heterogeneously sized CCVs, please explain or propose how the overlying clathrin coat interfaces with this amphiphysin orthologue to prompt its discharge. Do Maribel Geli's EM mapping studies put the assembled clathrin cap in close proximity with the Rvs167 ring? Please mention that vertebrate amphiphysin binds to both clathrin and AP-2 and so it might be worth looking for similar functional properties in Rvs167. Thank you for pointing this out. As requested we have now noted and addressed the observed difference in the text. As you have pointed out, while the rate of movement is the same, the extent of Sla1 centroid movement is larger in chc1∆ cells. This data is consistent with the increased immunolabelling seen in Figure 2F of the Idrissi et al., 2012 paper. However, neither we, nor Idrissi et al., see any difference in the distribution of invagination depths (see Introduction, first paragraph and Results and Discussion, third paragraph). This, together with the fact that the movement of Sla1 does not end with scission, but continues with the vesicle (Picco et al., 2015), makes it more likely that the greater extent of centroid movement is explained by slowed disassembly of Sla1-GFP (Figure 1—figure supplement 1) allowing us to track patches further into the cytoplasm. As requested, we have performed statistical analysis of the data shown in Figure 2—figure supplement 1A, showing that the difference between chc1∆ and wild type is not significant (p value > 0.1), thus, there is no significant trend towards tubulation at shorter invaginations. We further realized that due to superposition of wild type and chc1∆ data points, not all wild type data points were visible, making the similarity less convincing. We have now changed the style of data point symbols so that all data points are clearly visible. 4) There are many possible factors that can cause a change in vesicle scission and size and the authors do not show a direct link between clathrin and the role of Rvs167 in vesicle scission. Please state this explicitly. We have added the following sentence to make clear that our study does not show any direct link between Rvs167 and clathrin. This statement then leads into the discussion on how clathrin and Rvs167 may interact, as requested in point 10. Additionally, the authors study endocytosis in a clathrin knockout cell line, but do not discuss how sick chc1∆ cells and how this may affect their results. As requested, we have added the percentage of decrease in number of endocytic events, which has been published before (Kaksonen et al., 2005, Newpher et al., 2006). The number of endocytic events that form over a given time is reduced by 73% in chc1∆ (Kaksonen et al., 2005), which we now comment in the first paragraph of the Introduction. This was measured observing events marked by Sla1. We observe a comparable reduction for Rvs167 events in chc1∆. This is consistent with the observation that all Sla1-GFP punctae were found to successfully complete endocytosis in clathrin deficient cells (Newpher et al., 2006). Endocytic budding events in chc1∆ are indeed less frequent than in wild type cells, as described in responses to points 5 and 6, and thus overall there are less endocytic structures. Furthermore, using the marker proteins Sla1 and Abp1, we found a lower fraction of endocytic structures to be invaginations and a higher fraction to be vesicles in chc1∆ compared to wild type cells (Kukulski et al., 2012, see also the Materials and methods section, subsection “Membrane ultrastructures in the correlative microscopy data set”). This difference is likely due to the slowed disassembly of the marker proteins in chc1Δ cells (Figure 1—figure supplement 1), resulting in a higher number of vesicles being detected. Additionally, we added a sentence at the beginning of the Results and Discussion section to make clear that the endocytic events we analyze are those that successfully initiate budding. We have added a paragraph discussing the possibility of protein-protein interactions between amphiphysins and clathrin, referring to the mentioned immuno-EM study as well as studies reporting binding between clathrin and amphiphysins. WK acknowledges postdoctoral fellowships from the Swiss National Science Foundation and funding by the Medical Research Council (MC_UP_1201/8). Work in JAGB’s lab was supported by the Chica und Heinz Schaller Stiftung. Work in MK’s lab was supported by the Swiss National Science Foundation and the NCCR in Chemical Biology. This study was supported by the EMBL electron microscopy facility. © 2016, Kukulski et al. Clathrin-mediated endocytosis is an essential process that forms vesicles from the plasma membrane. Although most of the protein components of the endocytic protein machinery have been thoroughly characterized, their organization at the endocytic site is poorly understood. We developed a fluorescence microscopy method to track the average positions of yeast endocytic proteins in relation to each other with a time precision below 1 s and with a spatial precision of ∼10 nm. With these data, integrated with shapes of endocytic membrane intermediates and with superresolution imaging, we could visualize the dynamic architecture of the endocytic machinery. We showed how different coat proteins are distributed within the coat structure and how the assembly dynamics of N-BAR proteins relate to membrane shape changes. Moreover, we found that the region of actin polymerization is located at the base of the endocytic invagination, with the growing ends of filaments pointing toward the plasma membrane.